After finishing a legendary First Ten Year Healing Mission (1996-2006), Qinway Grandmaster Foundation has moved from California to Honolulu, Hawaii (a balanced energy center of the Earth) to begin its second ten-year spiritual mission to establish a NEW Enlightenment System with training special disciples who have a big wish of being enlightened in this life. Paul as a Volunteer Office Manager is accepting Training with Vicky's help to Prepare to be a qualified disciple. As a 1st American pre-qualified Disciple Paul made a Big Wish & Disciple Team Management Holy Mission. To awaken human beings from attachments to the physical body life to a soul-lifting energy life, this is one of Qinway's major holy missions. For every human being, the physical body is just temporary. Even if one lives to 80 or 100 year old, it is still such a short time compared with the unlimited universe. As a human being, the physical body stays in the 3 Dimension with much dirt, just like a lotus stuck in mud. Toxins from the mud come into the body in many ways everyday, so the body gets weaker and weaker day by day, and usually can only enjoy longevity for less one hundred years. However, when the physical body passes away, everyone's soul still needs to follow the universal law and spirit karmic force to go to a specific dimension. These dimensions that souls go to are very different. Some dimension has permanent peace & happiness, while other dimension may be with long time suffering. If we practice for spiritual growth in this life, we may discover our permanent living dimension to be with permanent peace and happiness -- which is Enlightenment as to give our souls a wonderful permanent "home" and avoid terrible lives in the future. Achieving Enlightenment has the following necessary conditions. (1) Body: Keep the body in a good condition before successfully achieving enlightenment. As the spirit succeeds in enlightenment, the body can turn into light accordingly. The body can come or go at will through the control of mind and the corresponding level of spiritual attainment. (2) Mind: In a highly balanced state, peace and deep calmness/concentration like a flat lake for a long time. (3) Spirit: Attain complete virtue, and be received by higher beings. Completely understand "causes and results", the origins of the universe and lives, and the transformation of whole body energy and spiritual codes to unite with the universe. Be free from the karmic force of rebirth, and transcend to the 4th dimension even up to 9th dimension. Q: Qinway Qigong has been so successful in healing, but why turn to an Enlightenment mission now? A: Saving one's body is a virtue, but much less than the virtue of saving one's spirit. Physical body is perishable, yet the spirit lasts. Many modern people are confused about where their spirits are going, what practice to follow as there seems to be too many teachings. The most miserable thing that can happen to a human being is that his or her spirit drops to a lower dimension, and can no longer assume a human body in the next life (let alone ascending to a heavenly realm). Grandmaster Qinyin carried a great wish to this world, i.e. to awaken modern people through modern language and effective techniques while integrating ancient wisdom. Qinway Qigong's first 10 year healing mission was an important period to make people trust, while the second 10 year spiritual mission focuses on the ultimate goal. During 2007-2008 Qinway's mission will still focus more on helping people make important life transformations, i.e. uplift the body, mind, and spirit from 3-Dimension on 3.2-Dimension, which is one of the most difficult things for human beings, including changing one's mind away from 3-Dimension lifestyle and concepts. The uplifting of the body, mind, spirit from 3-D to 3.2-D is the key bottleneck for following the step-by-step complete Enlightenment system. This is a dream - a dream that Grandmaster Qinyin has been struggling for a long time, a dream that many karmic Qinway supporters and students all have in the process of formation and development of the Qinway System, from deep Chinese mountains to the the capital of China, Beijing, San Francisco in America, San Diego, Los Angels and Hawaii...In this long journey, it has been the common dream of so many extraordinary supporters and outstanding students. Qinway Grandmaster Foundation fixes this perfect dream at establishing a Non-Profit New Enlightenment Retreat Center. Its final goal completely matches with the holy mission from higher beings in the ten major directions, as well as the common earnest wish of countless human beings on Earth who will greatly benefit from the Qinway Super Human Science System. Qinway Grandmaster Foundation will blend the love of the Heavenly Father and the compassionate power of Quanyin Buddha together, combine the five-thousand-year-old Chinese technology of energetic practice with the most advanced super human science, and condense them into a non-profit New Enlightenment Retreat Center to benefit humanity for generations to come, as shown in the above model and vision - whoever comes here can instantaneously be recharged with universal high energy. As early as 1996 when the Qinway System was successfully born in Beijing after revolutionary transformations from the Purple Bamboo Qigong College in South China in 1991, the above blueprint of a non-profit New Enlightenment Retreat Center have been planned and envisioned. The above blueprint incorporates the essence of the ancient Chinese Daoist culture by condensing the universal high energy field through the Eight Trigram buildings and Nine Palace Buildings. The building design of the Qinway New Enlightenment Retreat Center integrates outstanding considerations of time, space, directions, fengshui, geography and energy, which can prevent and avert any disaster, heal diseases and turn troubles into blessings. Qinway New Enlightenment Retreat Center will be open and compatible with any religion. People who live, study, work or practice at Enlightenment Retreat Center can increase their wisdom and longevity. If they receive direct guidance from grandmaster, they will have a good chance to achieve physical immortality and spiritual enlightenment in this lifetime. The Enlightenment Retreat Center will also provide service to help spirits who have left their bodies uplift their spiritual energy to better dimensions, e.g. those souls perished during the tragic 9/11 event. There will be many volunteers working at the New Enlightenment Retreat Center under an organized leadership and management team to provide health and spiritual programs and service for the body, mind and spirit for many karmic people. We sincerely wish and bless the early founding of the New Enlightenment Retreat Center, and sincerely hope karmic people with good understand support this truly beneficial cause through financial and human supports. Anyone who make outstanding significant contributions in establishing the New Enlightenment Retreat Center unique holy buildings will plan a "blessing field" for his or her after-lives, and achieve high energy aura equivalent to 4-Dimension. Anyone who actively support the New Enlightenment Retreat in various means, such as volunteering, donation and other ways, will be permanently recorded in Qinway's Holy Mission Virtue Tablet. Wish every human being achieve enlightenment. Wish every Qinway supporter unlimited blessings. (3) Submit feasible proposal and suggestions with your personal involvement to 930@qinway.org. that all your wishes for your continued mission here, on earth, be fulfilled. We need you, your guidance, in the difficult years ahead of us. By the Request of the Most Students, Grandmaster Decided to TRY to Stay in Hawaii to Finish Life Enlightenment Holy Mission. People who make a Big Wish and Sincerely Want Enlightenment in this Life, can Apply to become her Disciple Now. She will Select Qualified Disciples for the Special Training for Free. I especially appreciate Paul stepping up at this very moment; I also appreciate Vicky coming from California to Hawaii to be the important communication bridge of Paul and me. I am especially surprised that she made such a huge progress and WU in such a short period. Not only Paul and Vicky are asking me to stay again and again, but also there are excellent contributions from all the board members and other previous students, special as my Sifu... Now I have decided to change the original plan of returning to the mountain right away. I will try stay in Hawaii to finish this life enlightenment mission and bring a group of high level disciples. My Sifu also is very happy and will keep supporting! 1) Qinway's board member can be selected to the disciple team. The name for the board is changed to Board of disciple team Management. Every member who is working actively now can email to Qinway@hotmail.com if interested to be Grandmaster's disciple. 2) Grandmaster will accept the people who make a big wish and sincerely want enlightenment in this life time. They will get the basic to high level complete training. 3) Grandmaster will set up the first workshop for the reserve enlightenment disciples at Hawaii. Time may be reset or around March 10, 2008. After passing the test at the first workshop, members will be accepted into Grandmaster's disciple team. 5) For the reserve disciples, you will be tested based on your sincerity for this lifetime enlightenment and wisdom root, etc. 6) If you pass the test, you will become Grandmaster's formal elementary disciple. 7) In order to grantee the disciples have enough time for enlightenment practice, Grandmaster will keep 50% of the gross income of the energized products. This is the funding for her disciples to focus on enlightenment practice. 8) The disciples will devote themselves to assisting Grandmaster complete this holy mission, also understand to build the enlightenment temple is only outside, really is making the big wish of enlightenment to be true in this lifetime,so that to qualify service for the human beings. 9) At this time Grandmaster especially announces Vicky Bao have successfully passed the testing and become her first elementary disciple during the second 10 years holy mission.And she meets Grandmaster's selected criteria: both sides are very easy to communicate, Bilingual skill and good WU. 11) In the future the manager and leader of Qinway have to be Grandmaster's advanced disciple and then he can represent Qinway. Right now Paul is accepting training withVicky's help. Paul's position changed from chairman to Qinway's office manager for the grandmaster englightenment foundation. As a 1st American pre-qualified Disciple Paul with Big Wish & Disciple team Management Holy Mission, will formly moving to Hawaii in January 14 . 12) I'm waiting for your answer, Vicky Bao will assist to translate and answer your questions. As a summary of the small testing period, FEEL the important part are mainly focus on training the high level soul practice enlightenment professional, the second comes to the office and marketing policy execution. Every one who make a Big Wish and Sincerely Want to Be Enlightened in this Life, can Apply to be Grandmaster's Disciple Now. She will Select Qualified Disciples for the Special Training for Free, depends on the karma. The truth has been verified to really benefit human being's body, mind and especially the spirit. Through her more than 10 years very hard work, day and night, planting the unique seed for the world, the beautiful & amazing flower has been spread all over the country. Many successful healing stories. Welcome join Englightenment Prectice,This is most important in the life! Apply becoming grandmaster's disciple NOW! 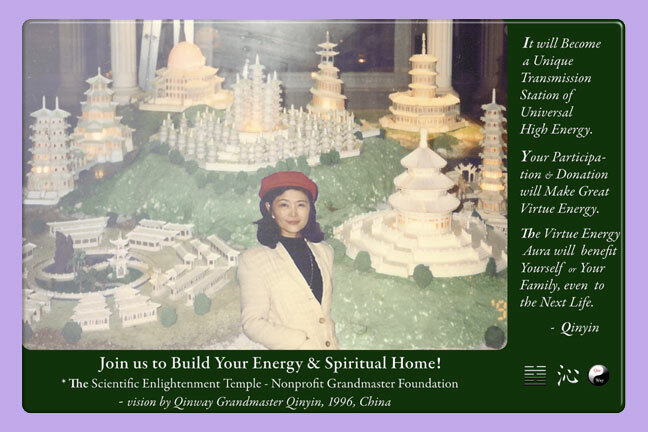 * To build great temple for benifit humanbeings,Qinway's holy mission needs your support! * Grandmaster's system suffers when the unique technological and spiritually advanced enlightenment system encountered with karmic hard testing. Virtue Energy Tablet Updates: See how impressive the virtue is this month!